Past studies have explored the therapeutic effect of music, particularly compositions by Mozart, for patients with epilepsy. Researchers at University of Utah Health found pairing music with one of four pain medications offered a promising complementary strategy to treat pain. In particular, the ibuprofen-music pair improved analgesic outcomes in an inflammation pain mouse model by more than 90 percent, while the cannabidiol-music and galanin analog NAX 5055-music pairings significantly reduced inflammation by 70 percent. The results of the study are available online on March 27 in the journal Frontiers in Neurology. The researchers evaluated this new strategy using two pain models--one model mimics inflammatory pain (carrageenan model) and one mimics surgical pain (plantar incision). Mice in the study were separated into two groups (five to eight mice per group). The control group was exposed to ambient noise while the music-intervention group listened to three three-hour segments of Mozart for 21 days. The compositions were selected and organized to enhance rhythmic, phrasal and chord progressions. The study was conducted four times to explore pairing music with ibuprofen (25 mg/kg), cannabidiol (100 mg/kg), levetiracetam (400 mg/kg) and the galanin analog NAX 5055 (4 mg/kg). Both the control and music groups received one suboptimal dose of each drug to evaluate the analgesic effect of music in the pain models. When paired with music, ibuprofen reduced pain responses in the inflammation pain model by 93 percent, as compared to the drug alone. In addition, music and cannabidiol or NAX 5055 reduced swelling by 21 and 9 percent, respectively in the inflammatory pain model. Music alone also reduced pain by 77 percent in the surgical pain model. According to Metcalf, medications currently available to treat inflammation do not show such a robust response on such a short timescale. “It is exciting to think of what this might mean for the anti-inflammatory effects of music interventions and where the research may take us next,” Metcalf said. The study also explored pairing music with various epilepsy drugs, but the experimental design was inadequate to evaluate the complexity in drug dosing and administration to evaluate this therapeutic strategy. The study was limited to two pain models and did not explore pain caused by nerve injury (neuropathic pain). In addition, the music intervention in the study was limited to pieces by Mozart. 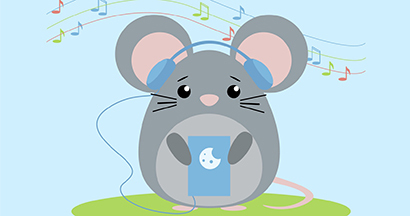 Mice hear at different frequencies than humans, and the effect of music volume or duration remains unclear. It also remains unclear if these results will be duplicated in people. Bulaj believes future studies should explore dose-dependent response of the music-drug pairing. Bulaj and Metcalf are joined in this study by Merodean Huntsman, Tristan Underwood, Fabiola Vanegas and Misty Smith at U of U Health; Adam Kochanski and Michael Chikinda at University of Utah; Gerry Garcia at Greatful Living Productions, Salt Lake City; Eugene Watanabe at The Gifted Music School, Salt Lake City; and H. Steve White at University of Washington. The article, titled Music-enhanced Analgesia and Antiseizure Activities in Animal Models of Pain and Epilepsy: Towards Preclinical Studies Supporting Development of Digital Therapeutics and their Combinations with Pharmaceutical Drugs, received support from University of Utah development funds.